Mull is the word used in Scotland for a promontory – think Mull of Kintyre that catchy song by Paul McCartney. 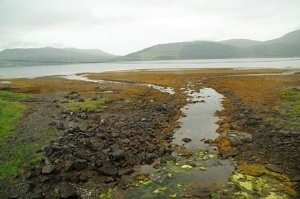 Mull is also the name of the second largest island in the Hebrides off the West Coast of Scotland. I think I put a foot on it once. Mull is an island of peninsulas which give it a long and varied coastline and it has spectacular wildlife from whales and dolphins to eagles and otters. 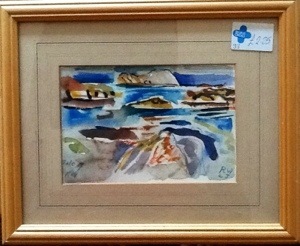 I think that is what this artist, Richard Conway-Jones, tried to show in this lovely watercolour simply titled ‘Isle of Mull’. He has certainly captured the colours of Scotland and I like it a lot. It cost £2.25.